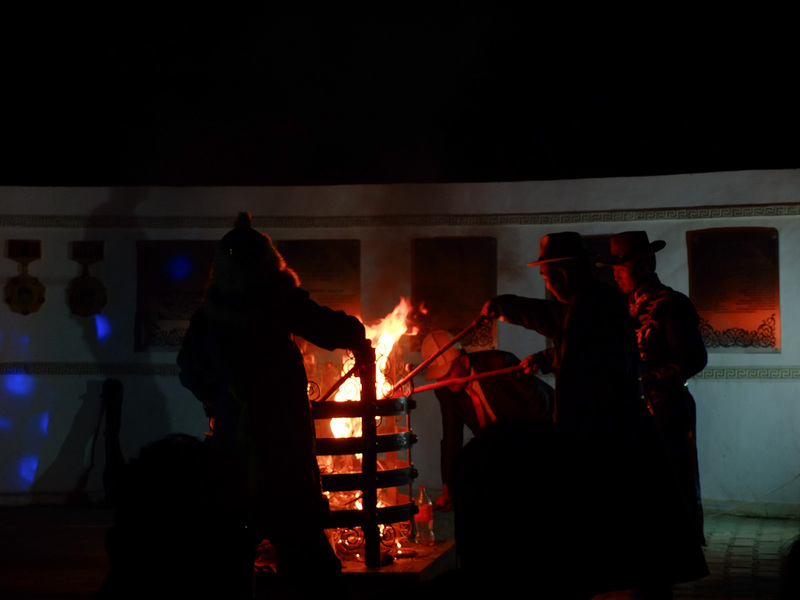 Mongolian Naadam festivities • Drop the tension! May Ling is waiting with us. 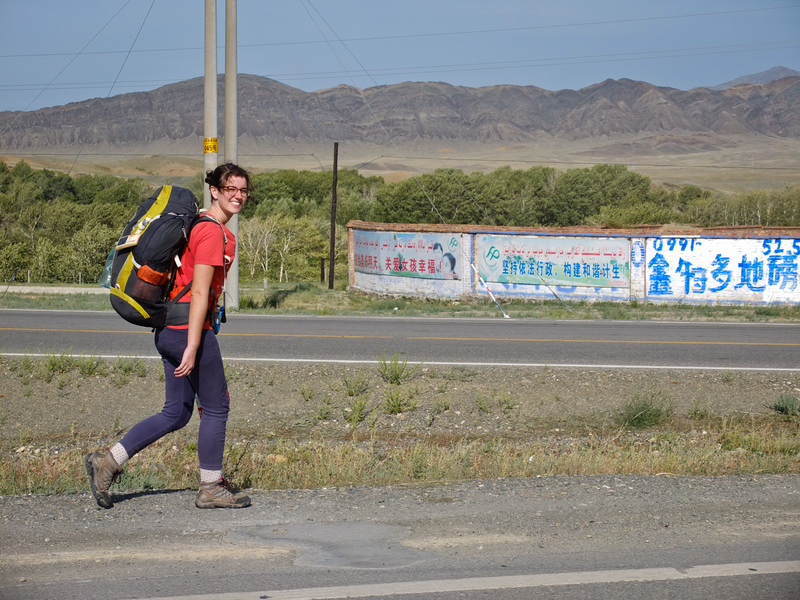 We have already walked a few kilometres together, along the dusty road, before we managed to flag down a passing car – a rarity out here. She knows a handful of English words and we a pinch of Mandarin, so there is some understanding between us. 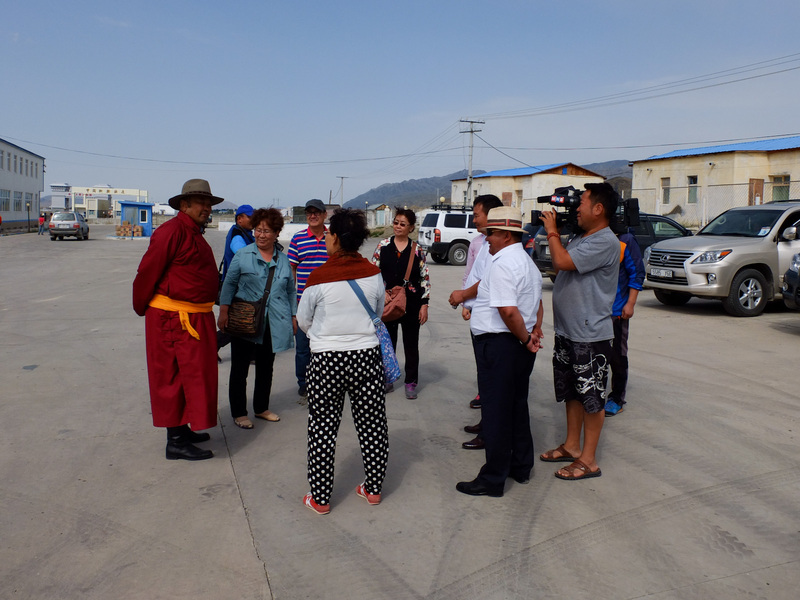 May Ling is patient and seems committed to helping us, but she is understandably eager to get into town. We have established that she’s come out here for work, but that there is no hotel in town. 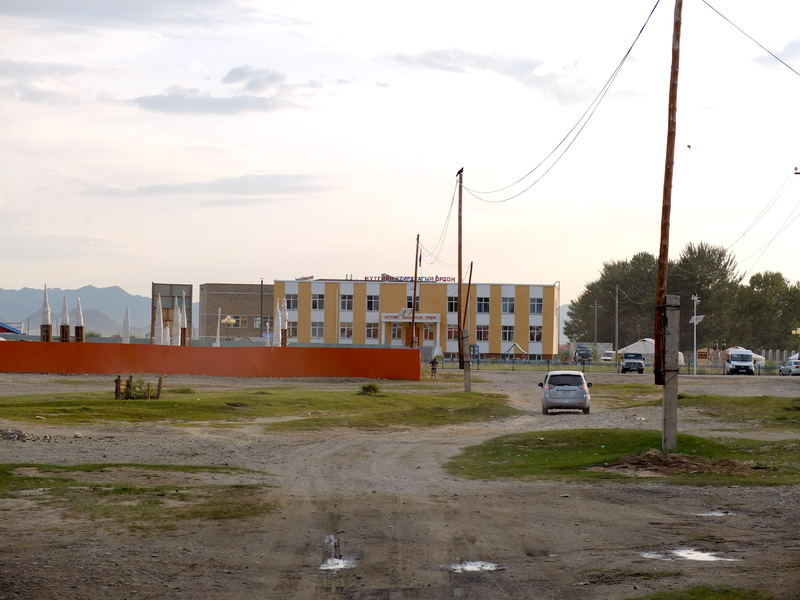 Anyway, next town is the border town, 30km further down the road, we’d rather sleep there so we can cross in the morning. 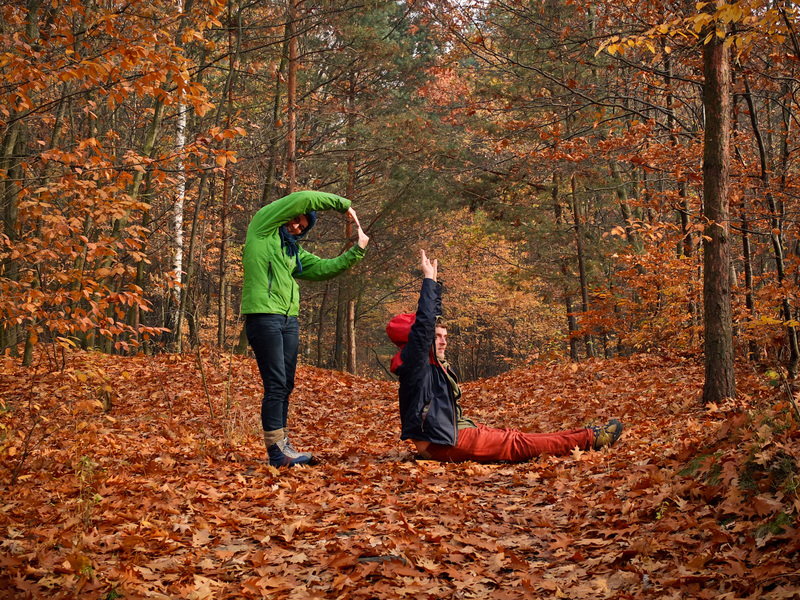 The wind is blowing so strongly that we stand sideways, angled against it. The sight of a car on the distant rise brings us hope – maybe this one? But so far we have only been disappointed at the sight of indicators flashing towards town. 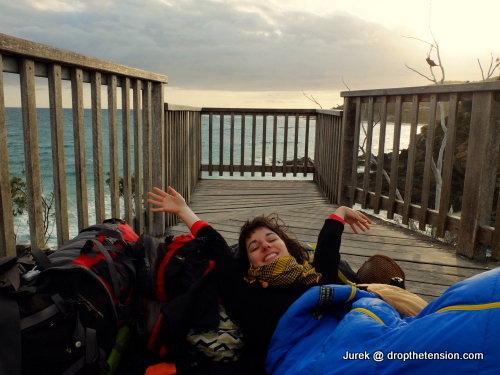 Reaching the border by tonight is beginning to look unlikely… And that wind is feeling cold. 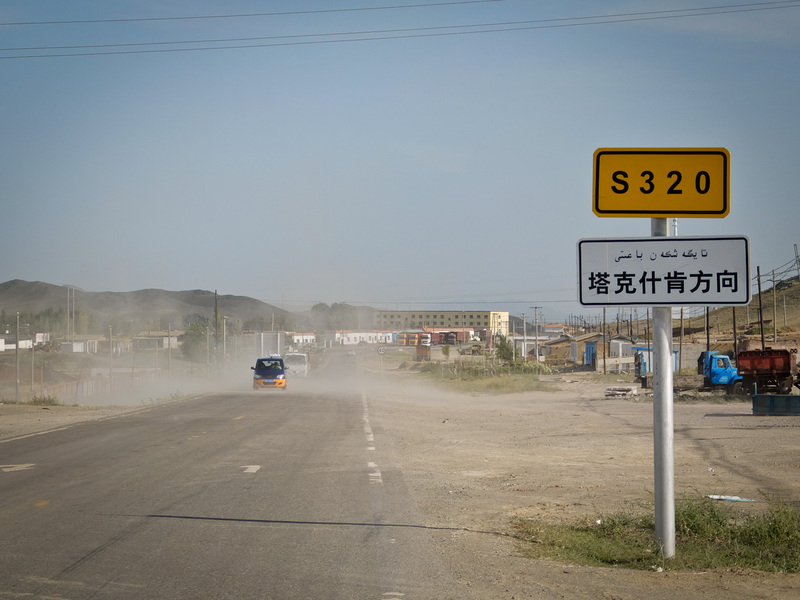 Hitch-hiking towards the Mongolian border, Xinjiang, China. 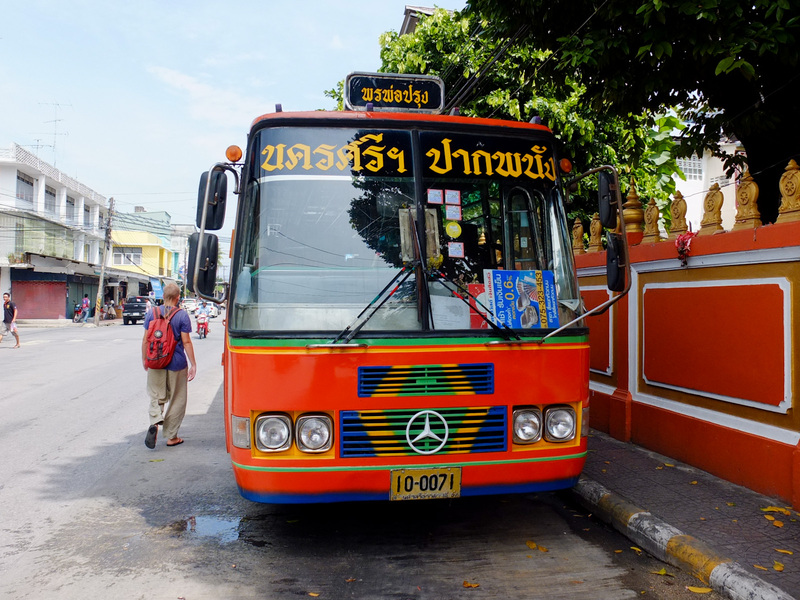 Then, from nowhere, a bus! 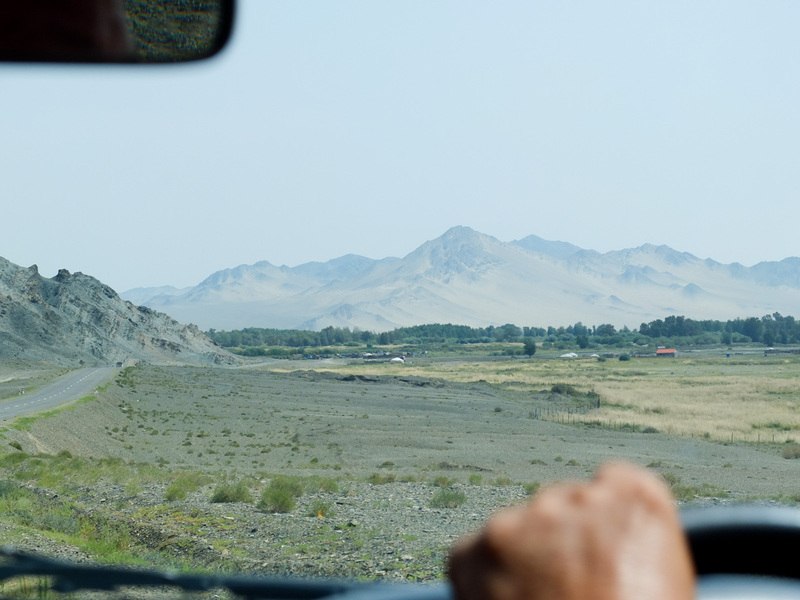 Usually we’d avoid buses, preferring to hitch-hike to meet locals, but on this empty, desert road, we’ll take anything. At our waving, the bus pulls over. May Ling speaks with the driver in Mandarin and we bid rushed farewells, as we clamber up the stairs. Jolly faces beam at us, up and down the aisle. We find the only spare seats. The lady next to me fusses moving her bags from the place. The man who seems to be in charge asks us if we go to ‘Mongol’. “Yes,” we reply. 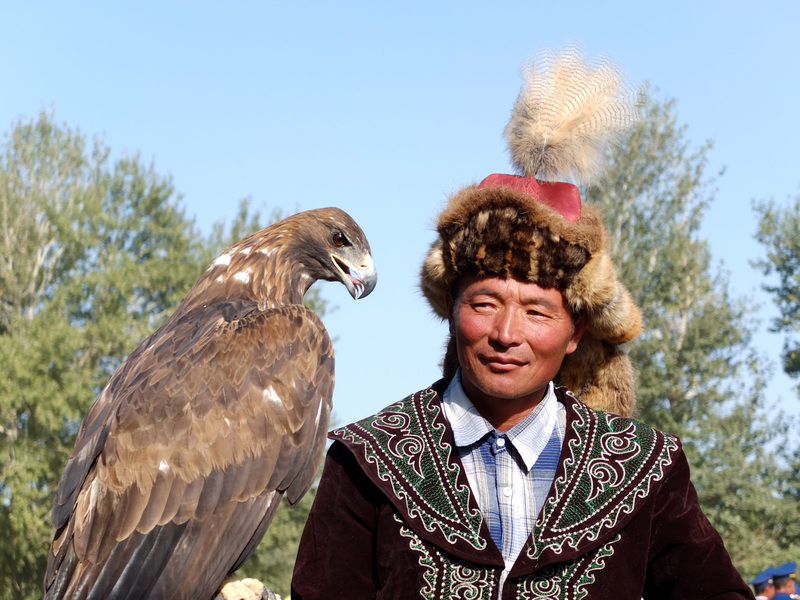 “We here are all Mongol!” He tells us proudly, pointing to the top-to-bottom reading script on his t-shirt. “We are going home!” When they find out that Jurek speaks Russian, we are introduced to our ‘translator’, a middle-aged man who learnt the language for his university studies. 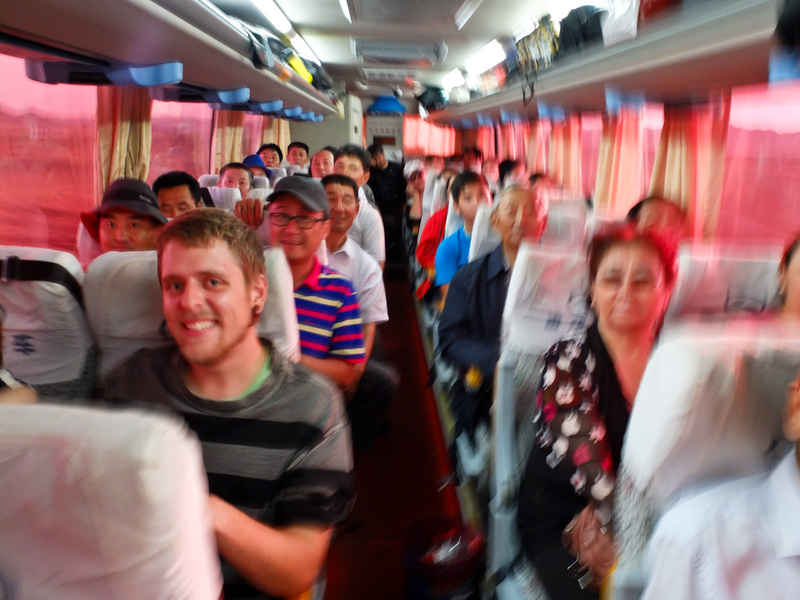 He explains that this is a bus of artists and musicians bound for a festival over the border. What luck! 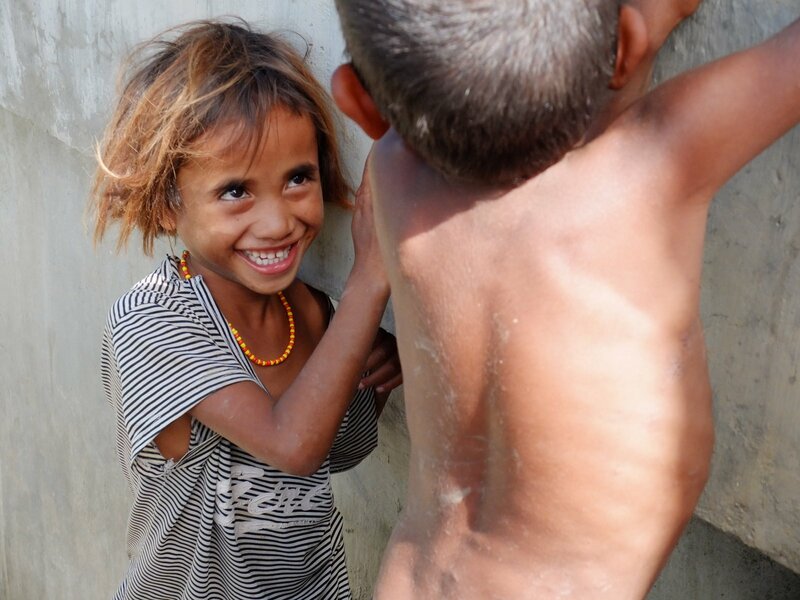 It seems no one can stop smiling. Welcome aboard! 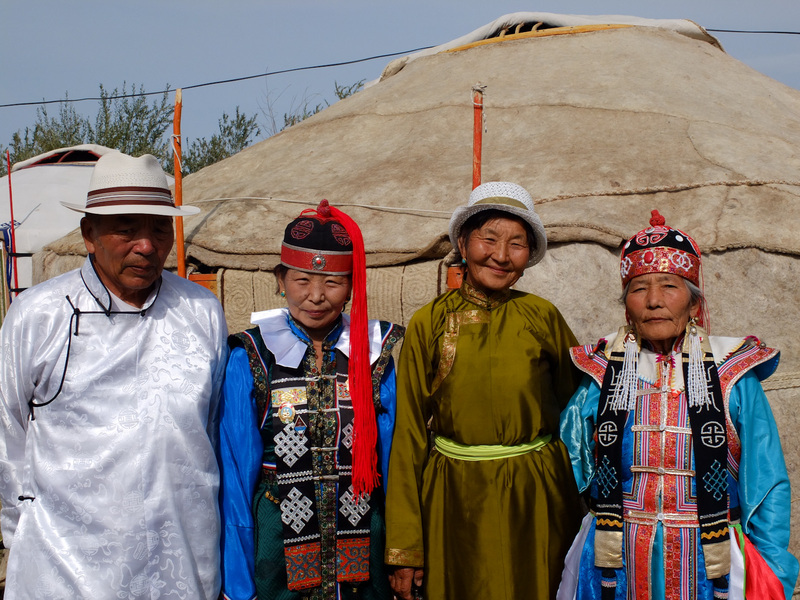 Our instant, new Mongolian family. 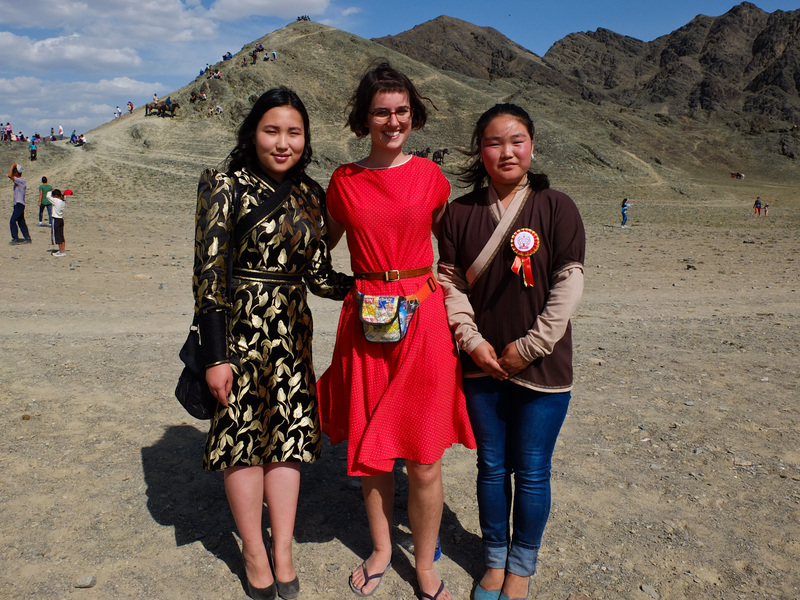 We learnt very quickly that the reputation for Mongolian people being hospitable is an underestimate! 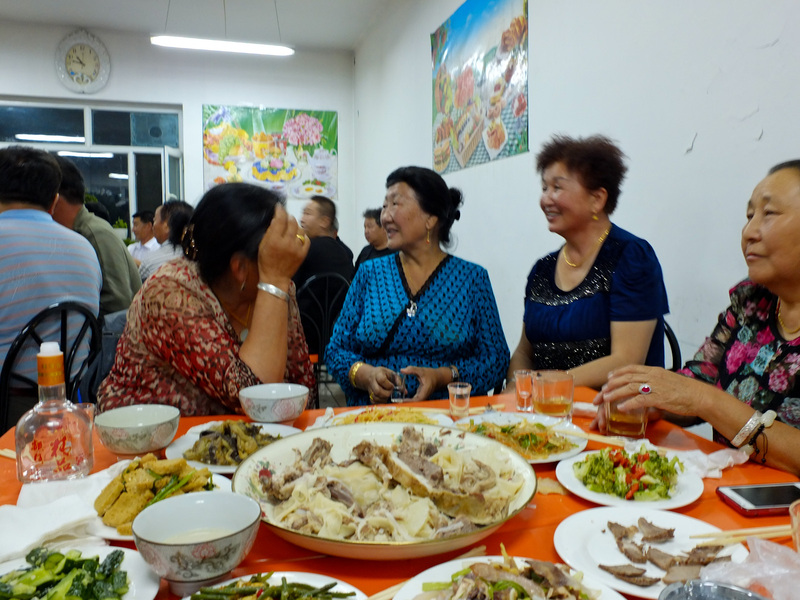 In the border town we were invited to join the bus group for dinner. 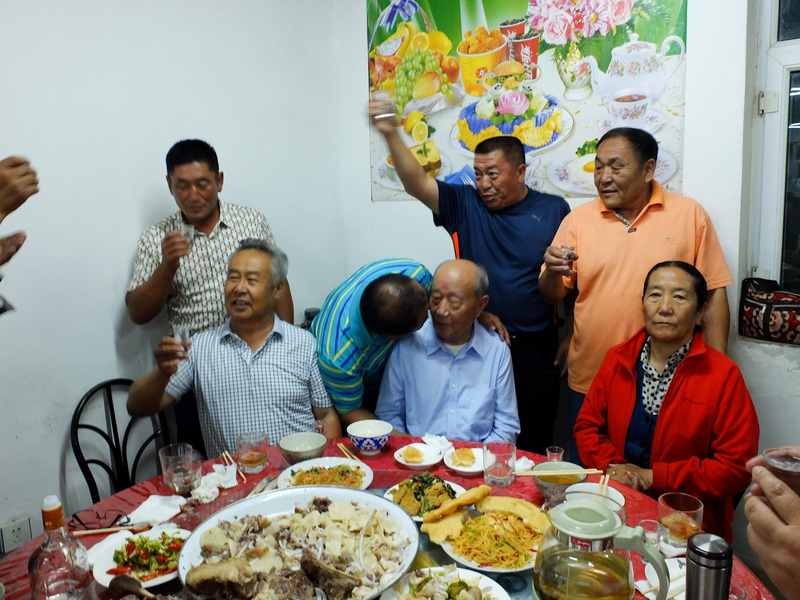 Mongols love to party, and there was much toasting with vodka. Then the singing began – the haunting voice of the lead trilling out through the microphone and the whole room joining in the chorus. It gave me goosebumps. At the end of the night, it seemed we had been adopted by the group and they took us back to their hotel to sleep. Our first Mongolian dinner. That’s a big plate of mutton in the centre, Mongolian standard. The white parts are fat. Coming from a country where it’s almost impossible to grow vegetables due to the long harsh winter, meat is very important to Mongols. In fact, they think there’s something wrong with you if you don’t eat it! Toasts, toasts and more toasts! 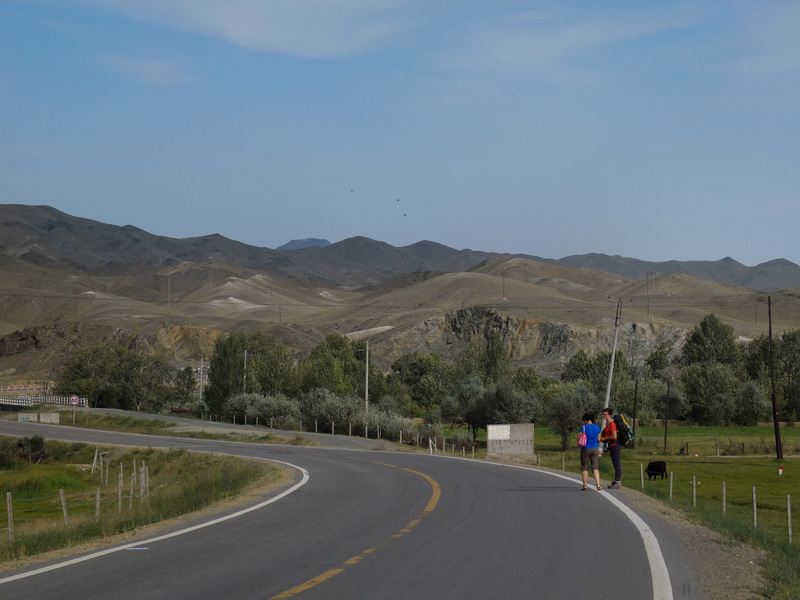 In the morning the bus took us the remainder of the road to the Mongolian border crossing. Where a film crew was waiting! Lights, camera, action! Seems our family from the bus are kind of a big deal! 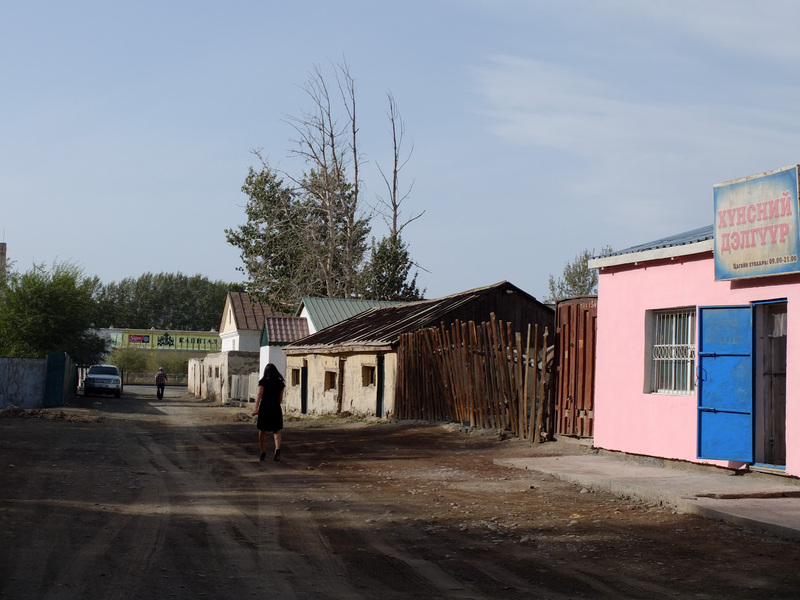 The small town of Bulgan seemed an unlikely location for an international festival, with its dusty, unpaved roads and old Soviet-style buildings… But we soon found that this is how most towns in Mongolia look. 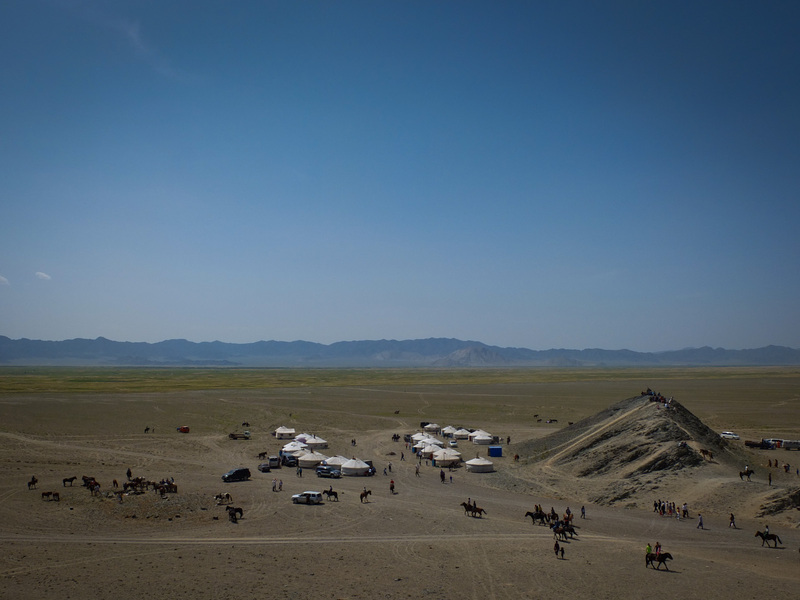 Traditionally nomadic Mongols didn’t build townships. 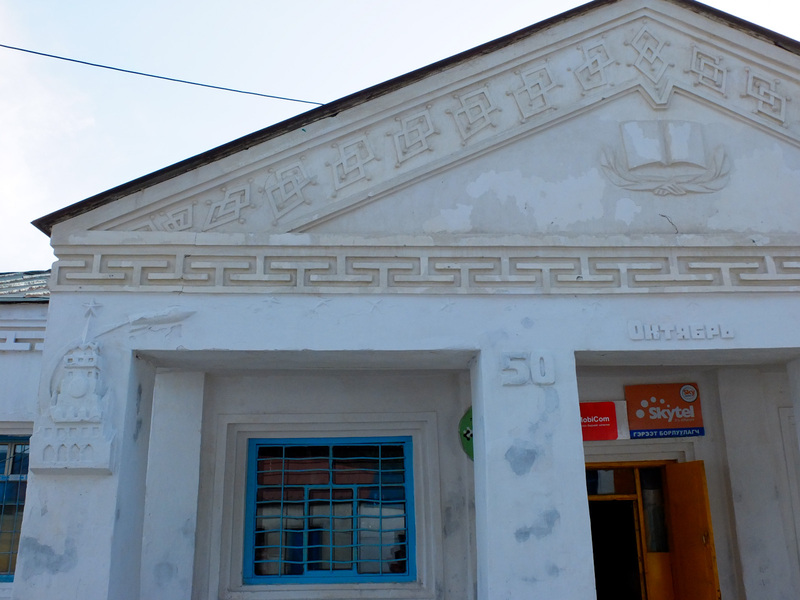 It wasn’t until the Soviets started helping in the building, that permanent towns and cities started to appear in Mongolia. 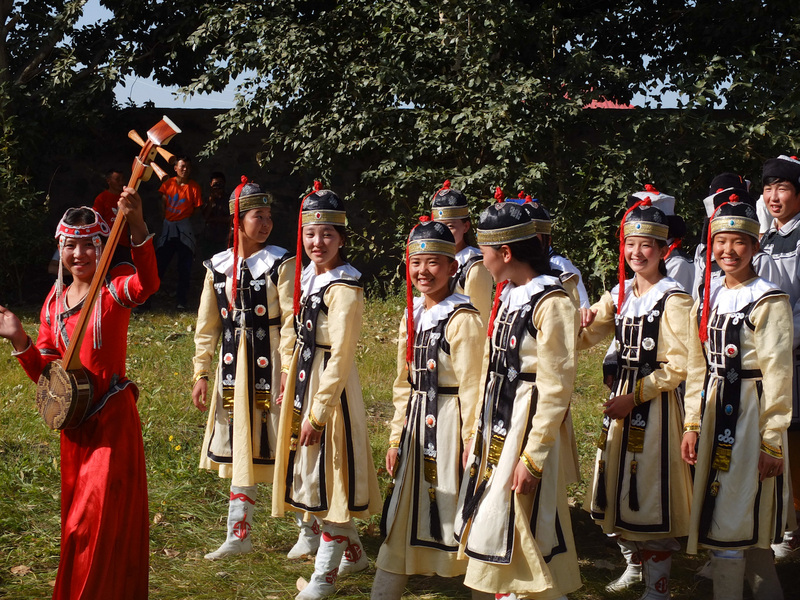 “Naadams” are Mongolian mid-summer festivals. 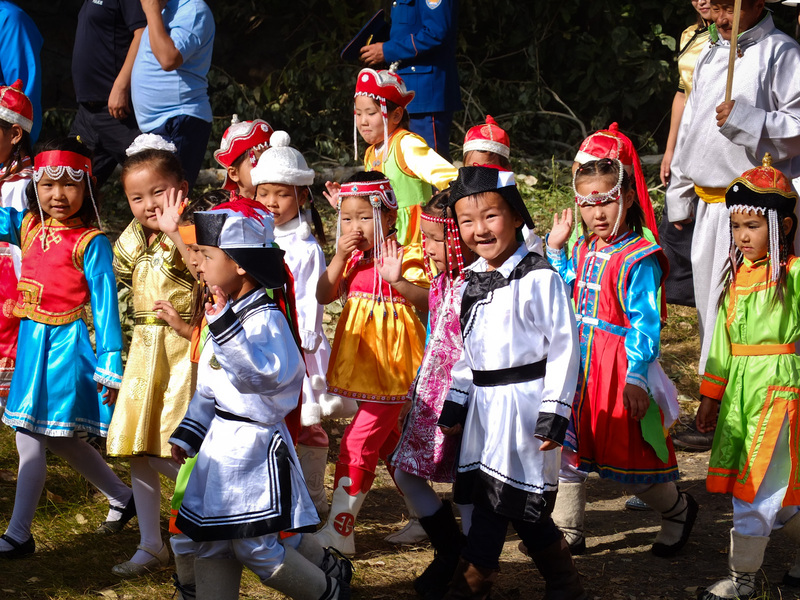 Arriving in late August, I was sure that we had missed Naadam for the year, as online searches only give information about the capital Ulaanbaatar’s Naadam, which happens in July. 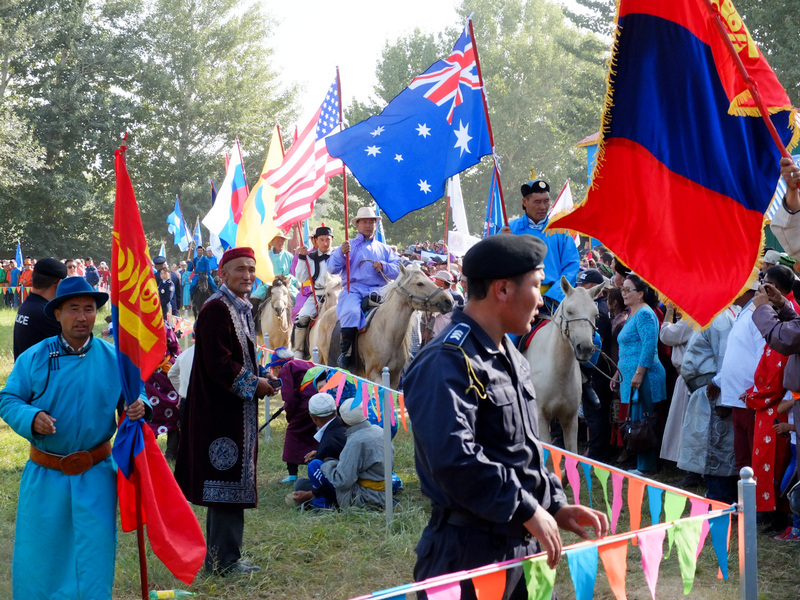 But we can now report that even small towns are likely to have their own Naadam festival, which it can be possible to stubble upon. 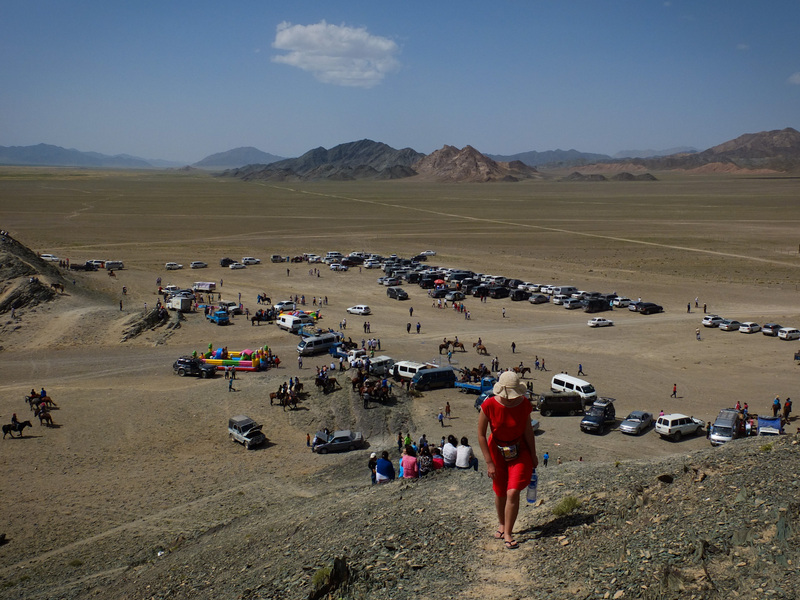 International Torguud Naadam, Bulgan, 2015. A woman shows us how babies were traditionally carried. 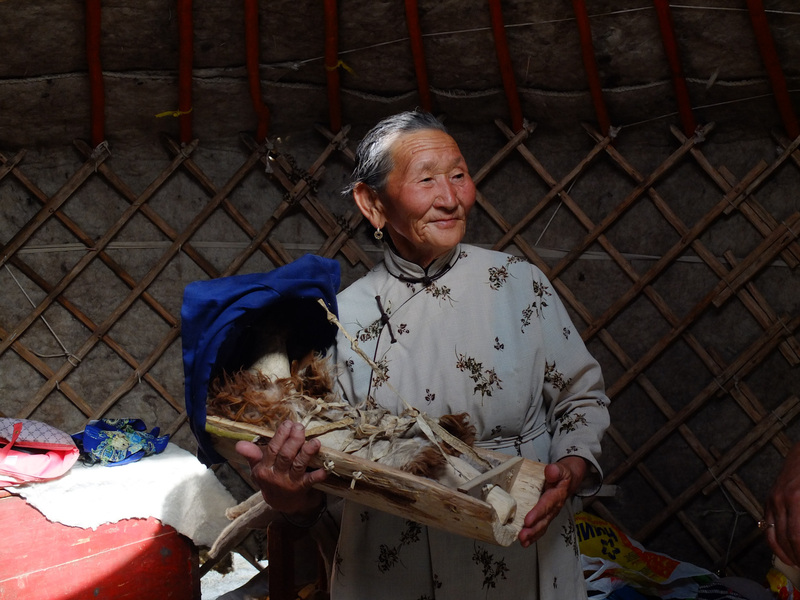 This was a yurt set up for demonstration of traditional ways of life. 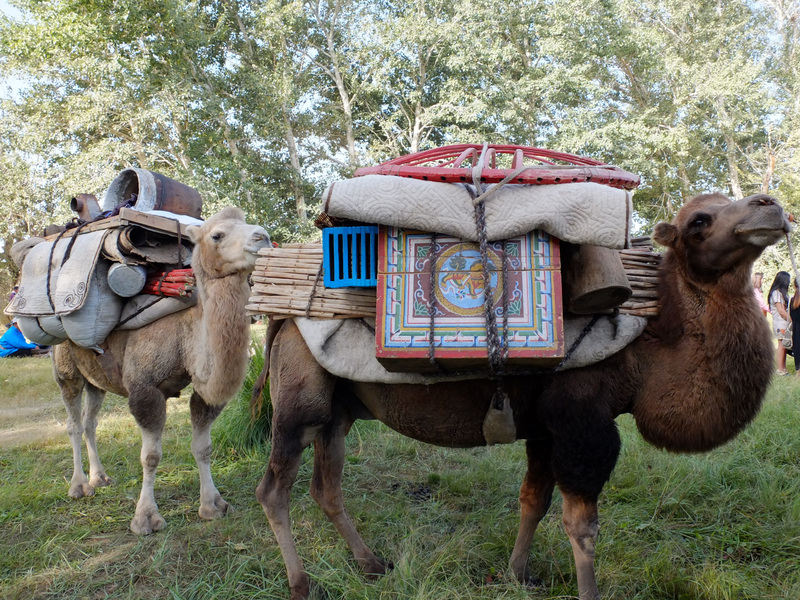 That’s how Mongols use to move their yurts around the countryside. 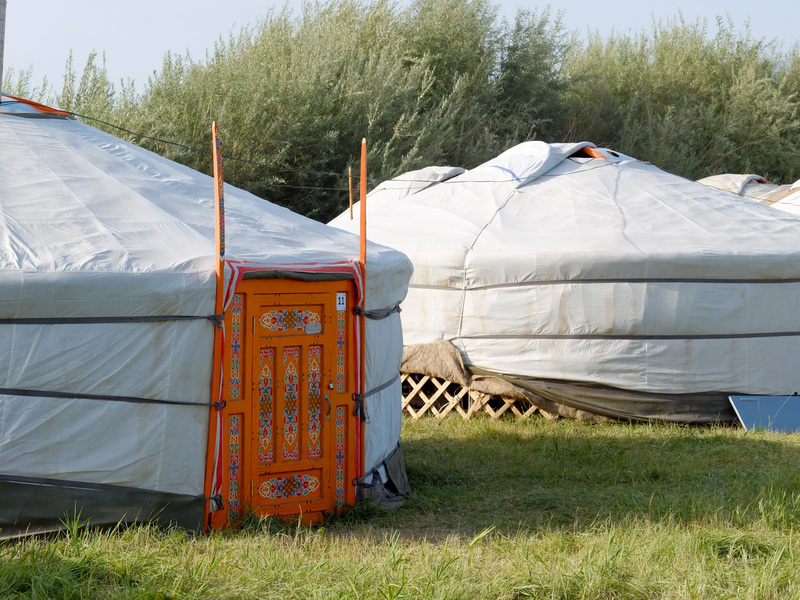 These days, nomads are more likely to load their yurts around in the back of their pickup. 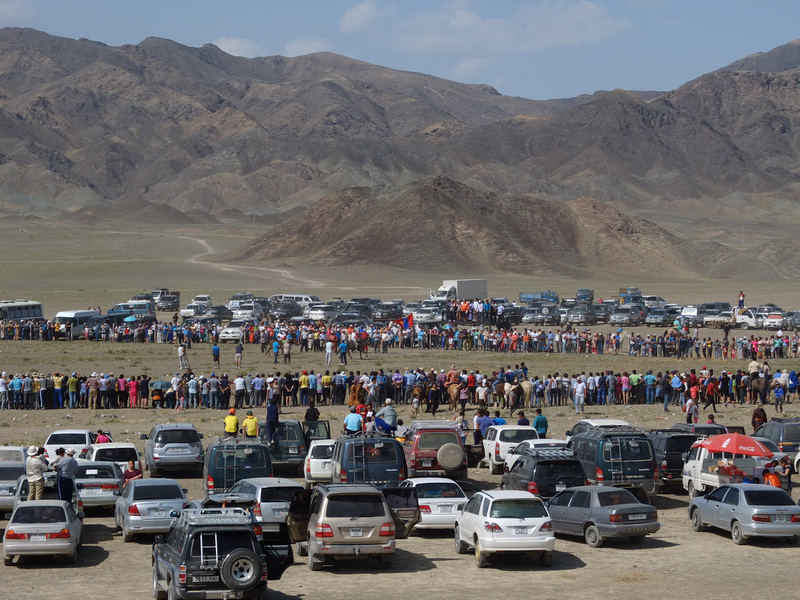 Other than wrestling, another prerequisite to a Naadam is horse racing. 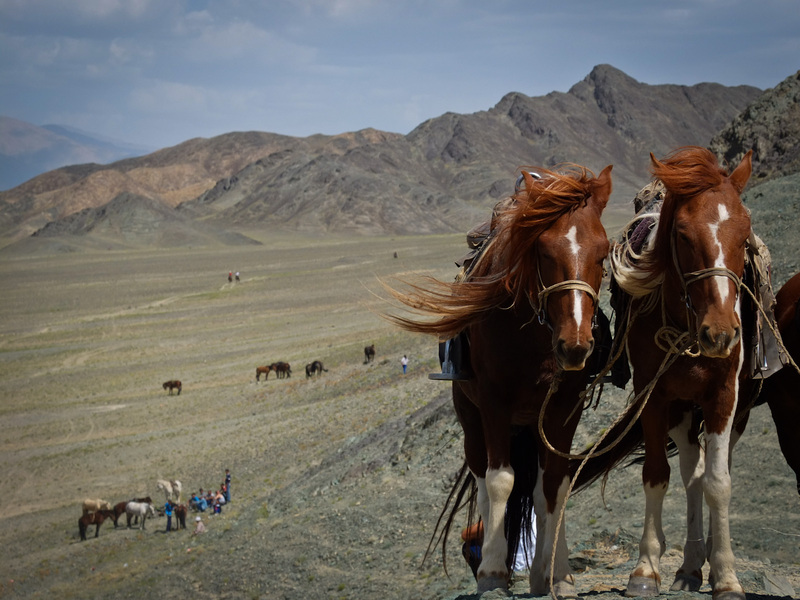 Horse racing looks quite different in Mongolia to the Western World. Instead of racing around a track, the race is long distance cross-country, from 15-30kms. Oh, and also the jockeys are children between the ages of 5 to 13 years old! 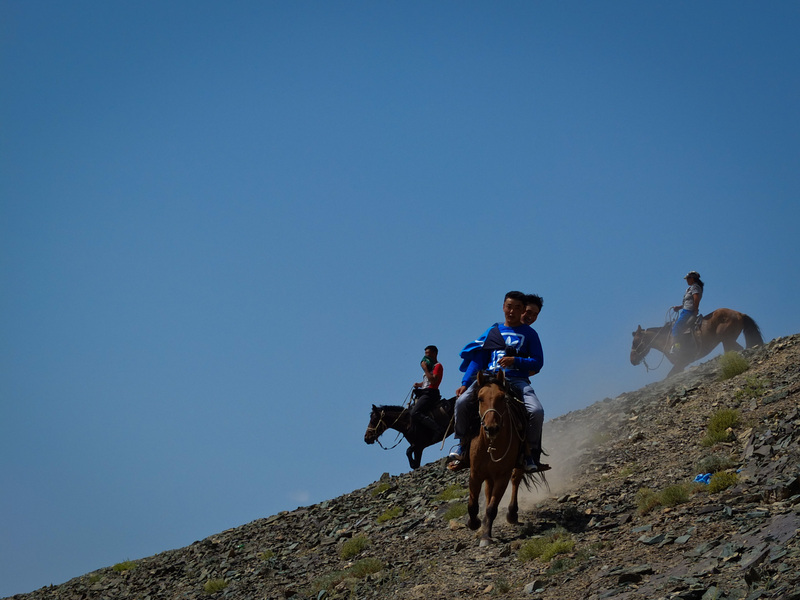 Attending the horse race, I understood just how tough the Mongolian race of people is. Standing watching the event was probably the most uncomfortable I’ve felt on our whole trip, perhaps in my whole life! 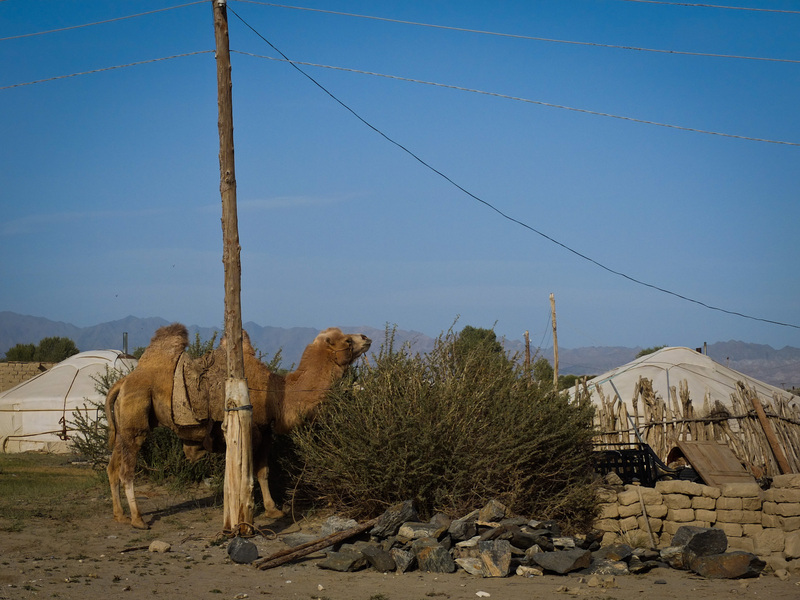 The land is completely dry, with almost no grass, so with the strong wind, dust was blowing everywhere. The sun is blazing hot, yet the wind make me feel cold. There is not a single tree to give shade, so there is no escape from the glare. I want to leave, but we only just arrived and are 15kms from town. But the locals mind one bit! In fact, they say this isn’t even a bad day, this is standard for them. They’re happy riding round on their horses or standing around waiting for the race to come in. And when the race comes, they chase after the winner, trying to touch the first place horse because it’s sweat brings good luck. Seems these people can bear anything with a smile. No wonder the Mongol empire was the largest connected land empire in history! I wasn’t the only one struggling with the extreme environment. 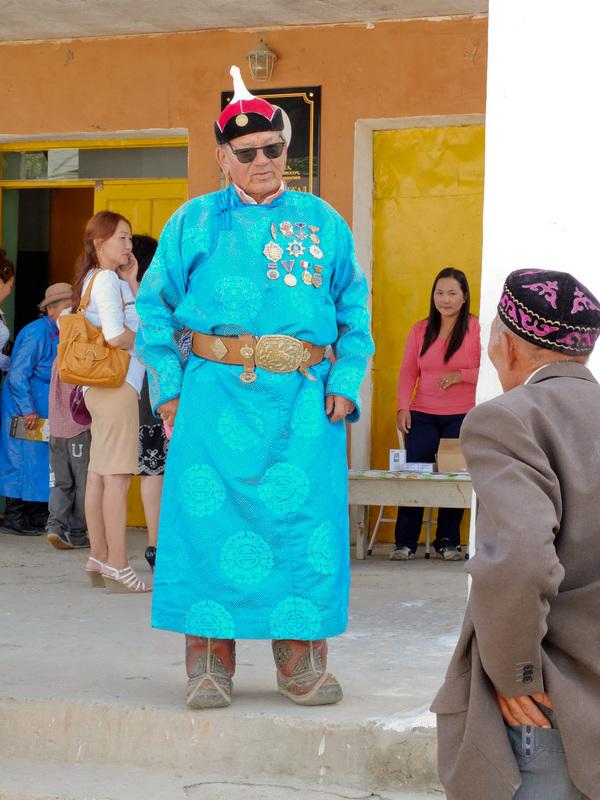 Boya, from Ulaanbaatar, whose father was an organiser of the Naadam, was having a hard time too – especially in her traditional-styled dress (I really don’t know how she could survive in it! Plus the high heels!! I think she spent most of the afternoon in her family’s car with the air conditioning on!) 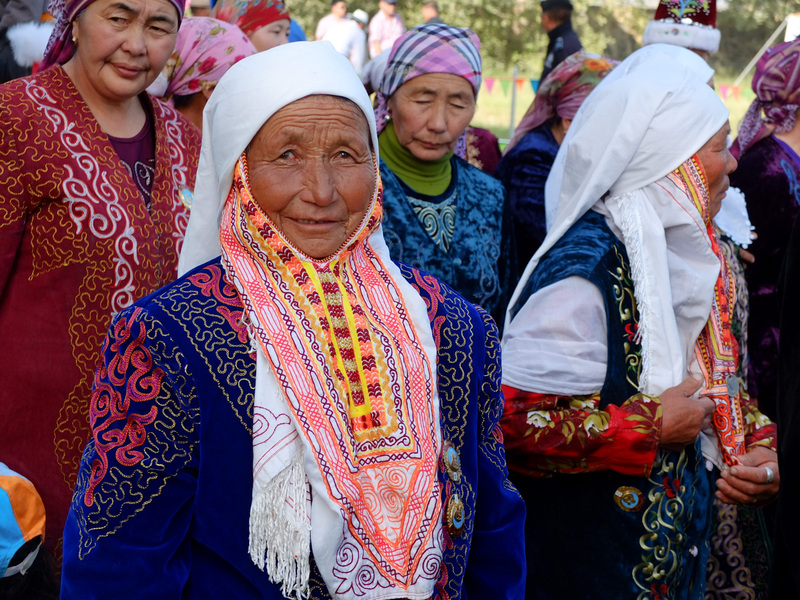 But her cousin, Toya, a Bulgan local, told us this was a normal day here. 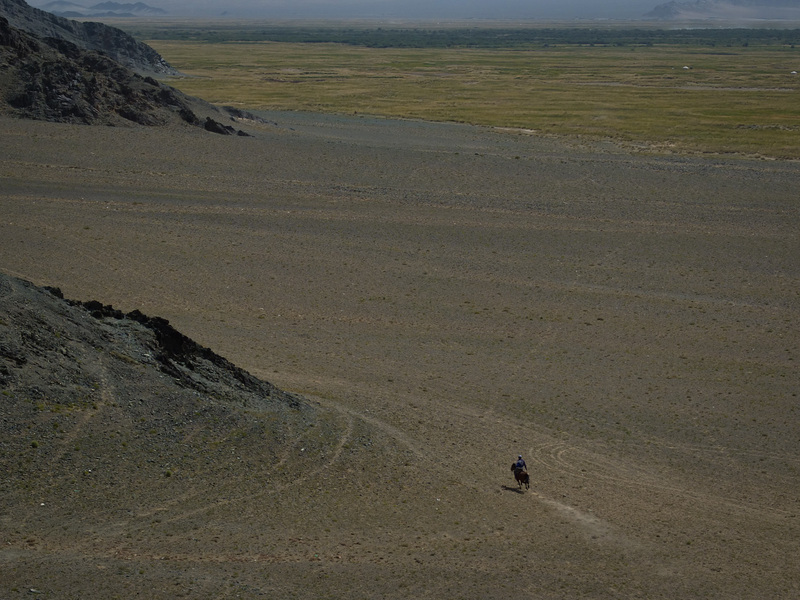 Fearless: Mongol children are born to ride. People have to be mighty tough to thrive here. Yurts selling meat dumplings and salty-milk tea were the only shelter from the sun, wind and dust. 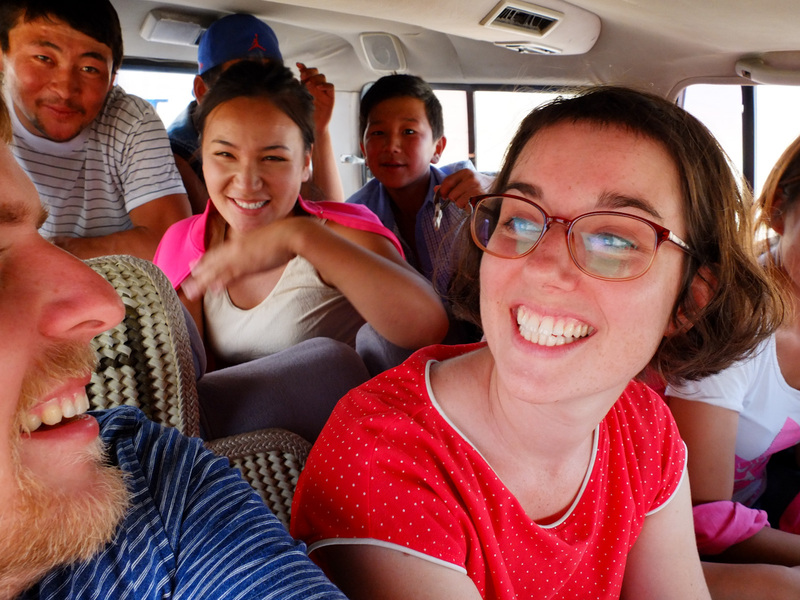 The time a Mongolian family picked us up hitch-hiking, even though they were already 8 people in the car! 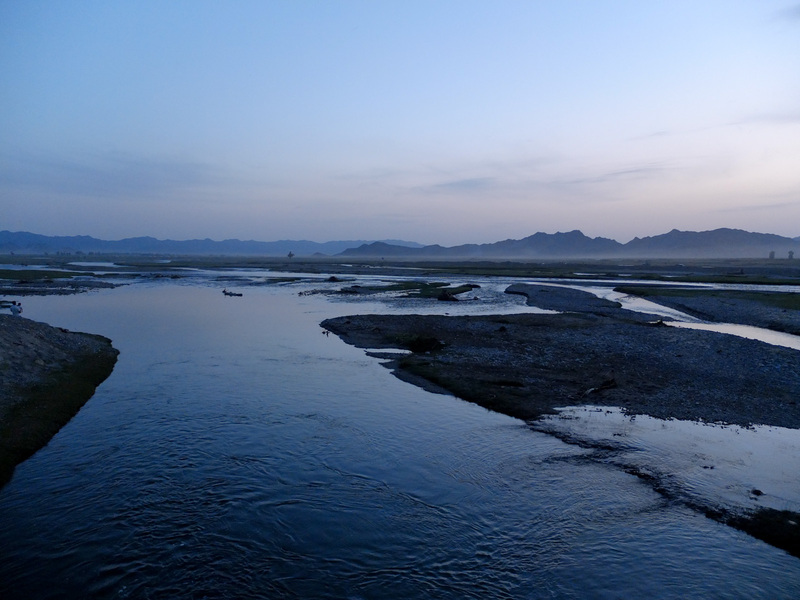 Bulgan river at dusk. 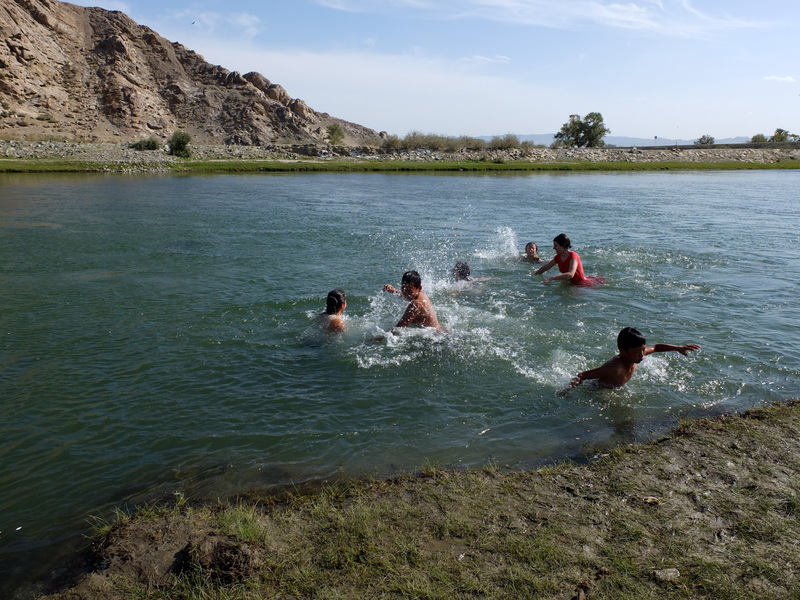 It’s the Mongol’s preferred time of day for swimming, because the water is warmer! Another great article, the photos are terrific. Thanks, Cax 🙂 It’s an easy place to take beautiful photos of! 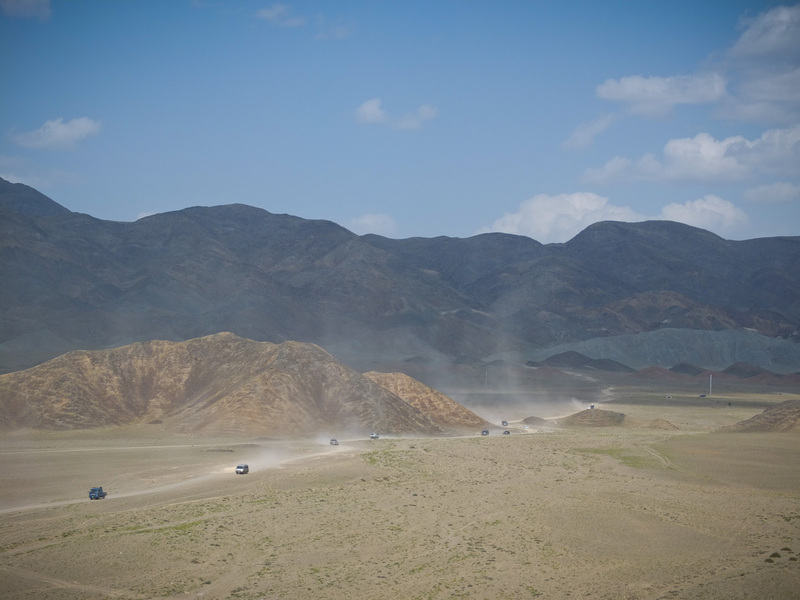 Pingback: Western Mongolia - Practical Guide • Drop the tension!